Kenley Airfield was formed in June 1917 when the former golf course and common was cleared by the Canadian Forestry Corps and commandeered for use by the RFC under the ‘Defence of the Realm Act’. At the outbreak of WWI, seven double hangars were quickly constructed on the airfield, and served in the defence of Croydon and Purley against German Zeppelins during the conflict, though the latter still killed 15 people in the two regions, and 160 in England as a whole. A much larger hangar was built in 1918 to accommodate the Handley Page 0/100 and 0/400 drop bombers; which had a 100ft wingspan. 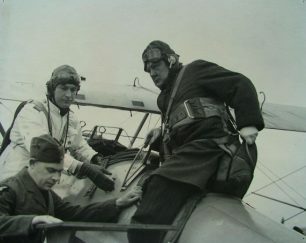 In mid-to-late 1918, the First Sea Lord and future Prime Minister Winston Churchill, having gained an interest in naval aviation, occasionally took flying lessons at Kenley Airfield under Group Captain Alan John Scott, who commanded RFC 60th Squadron in the first half of 1917 and who commanded the Central Flying School the following year. Churchill was slightly injured in an accident at the airfield in July 1918; after which his wife Clementine pleaded for him to stop flying and he thus did not receive his pilot’s license. There was also considerable political pressure, given his high position, for Churchill to stop flying for his own safety. However, given Churchill’s famously obstinate personality and his lifelong love of flying – as he is known to have flown in a biplane at a demonstration at Eastchurch for 45 minutes on Saturday 2nd December 1913; becoming the first Cabinet Minister in the world to act as an air pilot – it is no surprise he later tried again. Following the end of WWI, Sir Winston Churchill argued in the House of Commons that Kenley Airfield was too important to the aerial defence of London to be converted back into domestic public use; and though he was successful in persuading them, his critics later argued that he maintained the airfield solely because he was again trying to take flying lessons there at the time. Churchill crashed again at Croydon on July 18th 1919, when, again under the tuition of Alan John Lance Scott, his plane stalled in mid-air and crashed. Thankfully for the future of Britain, the plane did not catch fire and both Churchill and his tutor escaped, though the former thus again did not achieve a pilot’s license. In an attempt to discourage further attempts to fly in the future, Lady Londonderry subsequently sent Churchill a letter detailing the dangers of flying the next day. The injuries and/or shock Churchill received from the crash must have been somewhat more severe than his first crash; as Churchill sent a letter to Lord Winterson on August 30th 1919, and also a letter to Wing-Commander Alan John Lance Scott; who had also been injured in the crash. 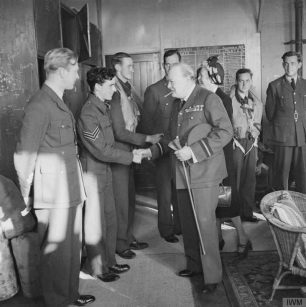 However, despite his setbacks and the crash marking the end to his attempts to become a pilot, Churchill would go on to become Honorary Air Commodore for RAF 615 Squadron at the Kenley Airfield. Of interesting note, shortly before the outbreak of WWII, another famous historical figure, the Japanese Crown Prince and later Emperor Hirohito – who would later fight against Britain alongside the other Axis powers – also visited Kenley Airfield with the Duke of York – later King George VI of England – on May 1st 1921 during Hirohito’s six month tour of Europe. Prior to the outbreak of World War II, Kenley Airfield was also subjected to hosting Nazi German Lufthansa planes, en route to Croydon airport, in the late 1930s; when tensions between the Third Reich and Great Britain were beginning to rise. These planes secretly served as reconnaissance of the RAF’s bases and aircrafts, with their covert passengers of trainee bomber and fighter pilots gaining familiarity with their potential future targets. Upon the outbreak of World War II, Kenley Airfield played a vital role in the defence of Britain against the might of the German Luftwaffe. RAF Squadron 615, equipped with Hawker Hurricane fighter planes, assisted in covering the Allied retreat from Belgium and their evacuation at Dunkirk; though they received substantial casualties. During the Battle of Britain between July 10th and October 31st 1940, Kenley was bombarded by the Luftwaffe on what is known as ‘The Hardest Day’ on August 18th 1940 – who three days earlier had also bombed Croydon, having mistaken it for Kenley; killing 63 factory workers. Having received an early warning via radar, Kenley Airfield’s 615 and 64 Squadrons were scrambled at 12:45pm, with some 60 Luftwaffe aircraft crossing the Channel and the attack beginning 15 minutes later; though some Allied fighters were still preparing for take-off. Three of the hangars on Kenley Airfield were set alight by Luftwaffe bombers, and the equipment store, four parked aircraft and the airfield’s medical facility was destroyed. Nine men were killed, including the station’s Medical Officer and local GP First-Lieutenant Robert Cromie, with a further ten being injured. Despite this, however, the 615 and 64 Squadron drove off the Luftwaffe attackers; destroying many of them. Thank you for giving me the opportunity to research and write this, and I’m honoured that you considered it to be the article of the month. I look forward to working with you again.